Over years, the typical IT infrastructure grows and is very likely a collection of separated, heterogeneous environments that can collide with today's requirement for companies to react quickly to changing business needs. This changing environment demands a middleware that is both robust and extensible as well as flexible when reacting to change. With WebSphere Middleware products from IBM you can operate flexible service-oriented architectures that overcome these integration challenges. The IBM WebSphere Service-Oriented Middleware product suite includes different integration brokers and a multitude of application and technology adapters. In addition to the adapter-based integration approach, this product suite supports a wide range of open standards to connect any back-end component in a service-like manner to the middleware infrastructure. This book highlights broker-to-broker connectivity to the SAP Exchange Infrastructure as well as direct communication patterns to the SAP WebApplication Server. 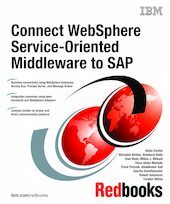 This book also illustrates how to integrate data and processes that are located in SAP back-end systems that use IBM Service-Oriented Middleware technology. The adapter-based scenarios use the WebSphere adapters for SAP, and the standards-based integration scenarios use the Web Services and Java Message Service capabilities that are built in to the products of both IBM and SAP.